I love including hand made and pre-made die cuts on my pages. They're quick and easy embellishments that often coordinate with paper collections so they're a go-to for me. Sometimes it's fun to find unique and different ways to use them on my projects. 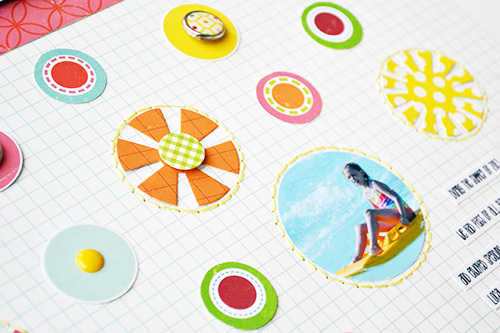 Today I'm going to show you how to combine hand stitching with your die cuts on a summer scrapbook page. 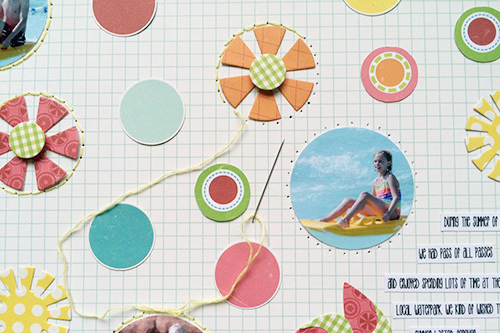 I was inspired by all the fun circles and polka dots in the collection so I based my page design on those. 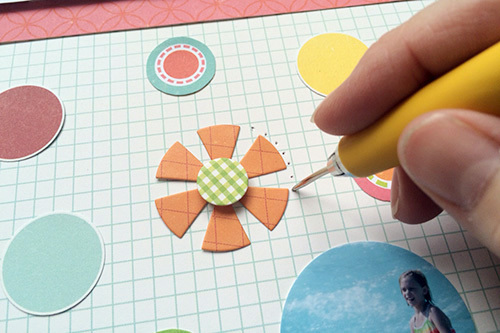 It was easy to use circle punches in various sizes to cut out my photos and the circles from the patterned paper. To add some visual interest to my page I also die cut some circular shapes using the coordinating Designer Dies for this collection. I used the Sweet Summertime 6x6 Paper Pad so I didn’t have to cut into my full 12x12 papers. Love those smaller paper pads! I also used some dies to cut my title. I mixed some different fonts to make the title more interesting and fun, and adhered the title strip with foam square for some dimension. To add emphasis to my photos and the die cut shapes, I hand stitched a border around them. I started by placing my page on a piercing mat (you could also use an old mouse pad) and piercing holes around each element with my paper piercer. Then I hand stitched through the holes with two strands of yellow embroidery floss. I like to use an embroidery needle with a smaller eye so I don’t tear the holes when stitching. I finished by adding some decorative brads, enamel dots, and computer generated journaling. 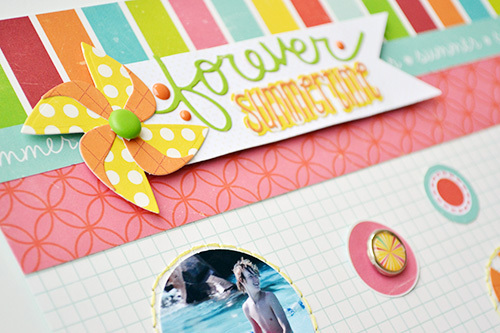 I tried to match the font of the “summertime” part of my page title to add some unity to the page. To see the original blog post with a full supply list, visit the Echo Park Paper blog HERE. 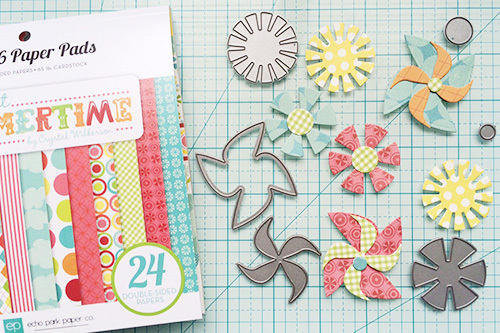 I love how the hand stitching adds texture and emphasis to my die cut shapes—give it a try on your next project!